Icons can be a lot of fun to create. Simple icons are relatively easy to create but more realistic icons can be quite challenging. In today's tutorial we will demonstrate how to create a detailed Fuji X100 camera icon in Photoshop. Let's get started! Open a new document in Photoshop. Set a resolution of 1024x1024 pixels. Then insert the image reference for the camera. With the Pen Tool (P) begin to trace the metal bottom part. Load the metal layer as a selection by pressing Command/Ctrl and clicking on the vector mask in the Layers Palette. Add a new Gradient Adjustment Layer with the following style. Then convert the gradient layer into Smart Object and add some noise with Filter > Noise > Add Noise. Add a Color Adjustment Layer and select black. Then with the Brush Tool (B) paint into the layer mask with a soft brush to create the metal shadows as the image below. To achieve a better result decrease the brush opacity. Set the layer as a Clipping Mask. For the upper metal part do the same as the bottom part (Step 3-4) but this time do not use the Gradient Adjustment Layer. Use a Color Adjustment Layer instead. This is because the metal reflections are a bit more complex. To create the upper metal reflection select the Pen Tool (P) and trace a white basic shape. Convert it into a Smart Object and add a Gaussian Blur Filter in Filter > Blur > Gaussian Blur menu. You have to repeat this process for the other reflections. As you can notice I've add a little drop shadow Layer Style in a reflection on the left part. Try to decrease the layer opacity too. The viewfinder is composed by two main parts. We'll begin with the outer part. With the Rounded Rectangle Shape Tool (U) draw a rectangle with a dark gray color as below and add the following style. Now with the Rectangle Shape Tool draw a dark grey rectangle and add an Inner Shadow layer style with a low distance amount. Duplicate the rectangle and this time set a higher distance amount. Use the image below as a reference. With the Ellipse Shape Tool draw a dark blue shape and add the following style. Create another shape with the same tool but use the white color, then and add the following style. Add a Gradient Adjustment tool in the Radial mode with the following gradient setting to create the glass reflections. Use the Layer Mask to limit the reflection. The next step is to draw a rectangle shape and add this style. Then decrease the shape fill opacity to 0%. Use as usual a Color Adjustment Layer to create some shadow in the metal part as below. Then create a gray rectangle shape and add a Gaussian Blur Filter. Place the shape below the viewfinder and set the blending mode to Overlay and the opacity to 33%. The viewfinder is done. Let's start with the flash. Draw the correct shape and add this Layer Style. Repeat this step but this time use this Layer Style instead. If you want you can add a Brightness/Contrast Layers Adjustment to brighten up the flash as I do. For the shutter button create a thin shape as below with the Rounded Shape Tool (U). Next add a Gradient Adjustment Layer with this style. Now all you have to do is to drag and drop the vector layer mask from the previous shape layer to the gradient one. Simple and Easy. :) Finally add a little Inner Shadow Layer Style the gradient layer. Duplicate two times the previous layer. Then decrease their width by pressing Command/Ctrl + T. Arrange them as below. To create the handles draw a shape with the Rounded Rectangle Tool (U) and add this Layer Style. With the Rectangle Shape Tool draw a little rectangle and put it below the previous shape. Next add this Layer Style. Duplicate the handle and place it as the image below. Create a little shape between the flash and the viewfinder with the Rounded Rectangular Tool (U) and add this Layer Style. Draw two circles with the Ellipse Shape Tool (U), the first with a black color and the second with a dark yellow. Then add this Layer Styles. Draw another with the Ellipse Shape Tool (U), use a metallic color. Then add this Layer Style. Now duplicate the circle shape and decrease his dimension with Ctrl/Cmd + T. Use the Drop Shadow Style only for the first ellipse. Now draw the final circle an add this Layer Style to create the metal reflection. With the Pen Tool (P) draw a shape like below as usual use a metallic color. Now add the following Layer Style. Use another Rounded Rectangular shape to achieve the little red mark. Apply this Layer Style. For the middle part draw the appropriate shape with the Pen Tool (P) with a dark gray color. The for the leather texture you can follow this useful tutorial, obviously on PsdTuts+ . As you probably notice I've add another hole, a small black button shape and two little dark shape on the bottom part. When the texture is done you can add an Adjustment Layer to change his brightness. Then add this Layer Style to the middle shape layer. Let's do the lens now. First draw a circle with a metallic color and add this style. Draw another smaller circle and add this Layer Style instead. Then select the two circle layers in the Layer Palette and merge them into a Smart Object. Finally add some noise via Filter > Noise > Add Noise. Select a dark gray color and draw a circle as below. Add this Layer Style. Now we have to create other three circle. Here it is the Layer Style for the first one. The style for the second one. Create another circle and decrease the Fill Opacity to 0% in the Layer Palette. Add a thin Layer Style Stroke with a dark green color. Then duplicate and transform the circle as below. For the glass the procedure is the same. Add a circle with the following Layer Style. Add a second smaller circle inside the first one with this Layer Style. Draw a circle with the same size of the circle in Step 36 and use this Layer Style to add the reflection. Try to change the gradient position while the Layer Style window is open by simply clicking on it in the canvas. Add some text inside the lens. To achieve this curved style create a circular path with the Ellipse Tool (U) and then with the Text Tool click on the path and add the text. Draw a C black shape with the Pen Tool and add this Layer Style. Add a black rectangle shape below the C shape with this style. Finally draw another shape like below with this Layer Style. One final step is to add two little metal shapes with the Pen Tool (P). 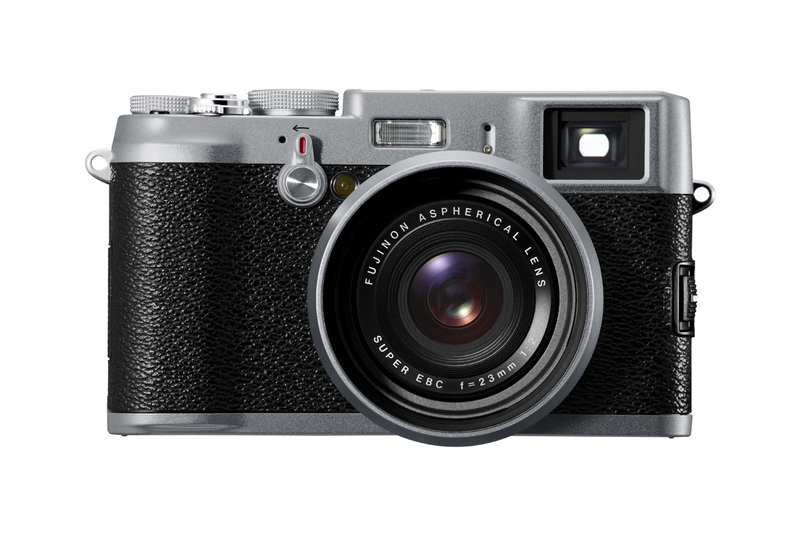 So the Fuji X100 is done! I've add a custom background. Of course you can customize the icon as you like. Final Tip: improve the sharpening with the Unsharp Mask Filter. Hope you like it!